Tagged under Kazuma Kondou, BONES, Series. day to become a ref boarding champion like Holland. The first impression of watching this anime, I was like "Wao, this is so cool! Surfing is cool! Holland is cool! Damn!" 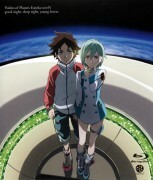 Eureka seveN is pretty cool. The concept of reffing is good. I really like watching how Holland and Renton handle their own LFOs performing tricks and evading attacks so skillfully just by using a single board. I bet Tarzan gliding through the branches must have come from surfing. The art department comes out pretty strong in overall, music comes second. Oh, and one more thing, the character designs are pretty deceiving if you realise that. I've always thought Moondoggie and Holland were cool people. And I was hugely surprised after seeing their real selves in Gekko-go. I didn't really know how I felt about this anime after watching it. The plots and concepts are numerous and muddled and the characters just add to the complication of it all. Its interesting enough and sports great animation but I found myself disliking a majority of the characters and haven't had the desire to watch it again since. From the half to three quarters of the first season that I've seen, this is a solid anime. It kind of feels like a surf/pirate version of NGE, so not really unique though it has strong characters and development. My first anime film and i love it! 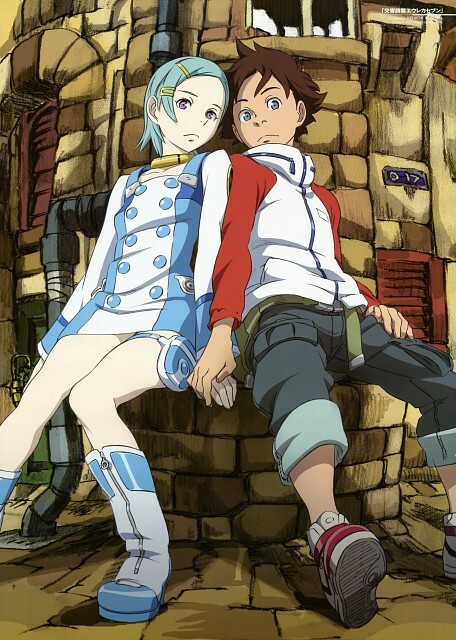 the story of Renton and Eureka forbidden love turn out to be possible! and how this film teach all of us about trust, love and hatred...it all charge toward one with the mecha genre, it makes the fighting scene full with emotion! just perfect! This show happened to be one of the many Adult swim has showed me over the years that I have learned to love. The first time I saw this series I started watching about midway threw so I didn't fully understand it, but I like it and the general sense it was going in, I happened to watch again from the beginning and enjoyed watching it over once again. The first few episodes are a bit confusing, but once you get past that, this is one hell of an awesome series. Great animation, great music, and the characters are phenomenally developed throughout the story. It gets a rewatch AT LEAST once a year. I love it. Probably going to have to write a review about it soon. Whoa! Such a wonderful series with a great story and more-than-enough interesting characters. It had me at the edges of my seat some times, and it has to have one of the cutest couples in it I've ever seen. Good action and in-depth story! 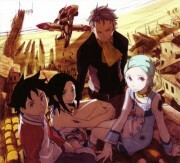 After watching this anime soooo many times i can still say its my favorite anime.... ever. in fact if there was a score higher than 10/10 it would have it frome me hands down.this anime is a medium long story line whith events that seem mostly random but come together in the end for renton. the show has plenty of comady and a mildly OT atmosphere. it is a love story so you will need to be a little older to catch whats going on. but all and all, this is was and will be the best ive ever watched. Have only seen it twice -- and took at least that much to barely grasp it. A good series, but pretty complex! Voice of Holland, Captain of the Gekko State Ship also plays secondary lead role in "Wolf's Rain" (series). In both he plays the role of an older-secondary to a younger lead. Also in both, the younger lead appears destined to end up in an unknown future with the female lead (in both series). The female lead, in both was a non-human, alien female looking creature who, it is doubtful, could psychologically reproduce with humans. The role of the older secondary to enable the 'sacred' relationship between the (to be sacrificial male) and the ever virginal, ethereal and somewhat 'off' female. Hmmm... Not sure what jungian archetype this follows, but it seems familiar. Amazingly different storyline with similar sets of facts. Gundam meets surfer culture; all the fun of learning to cope with killing someone while searching for great waves. The show built up a momentum that kept me interested until the last couple of of episodes, which were atrocious. An ok anime. Don't like the main characters Eureka and Renton (the most annoying male protagonist I have ever seen although he did get better after a while). The only reason I continue to watch is because of Dominic, Anemone and Talho.